Yakima, WA – Borton Fruit has been supplying Langers for roughly a year with processor apples for juicing. We are very pleased to be working with such a reputable company in the industry. Langers is well known for their wide variety of 100% pure fruit juices, juice blends which contain added nutrients, essential antioxidants, minerals and herbs, as well as a zero sugar added section with multiple juice options, a Kid’s juice section, and even a new pure spring water line with a hint of fresh fruit flavor. Langers was established in 1960 and since, has been a leader in the juicing arena. They’ve remained actively involved in every aspect of making juice and continue coming out with new, healthy products for people of all ages to enjoy. Borton Fruit and Langers have quite a bit in common and one of these main faucets is striving to develop our businesses in a sustainable manner with family at its core. We are more than proud of our partnership with your company and are looking forward to working with you for years to come. 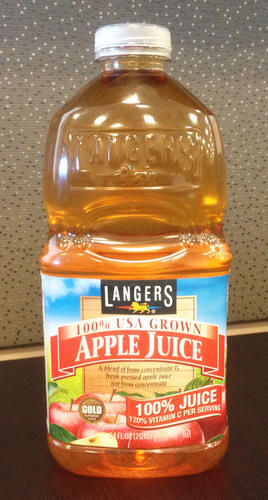 Check out Langers 100% USA Grown APPLE JUICE, and look for their Meet Apple Grower Borton & Sons label. The Langer Brand can be found in major retailers across the country. Thank You Langer Juice Company, Inc. for being such a great partner and featuring our Borton Apples!